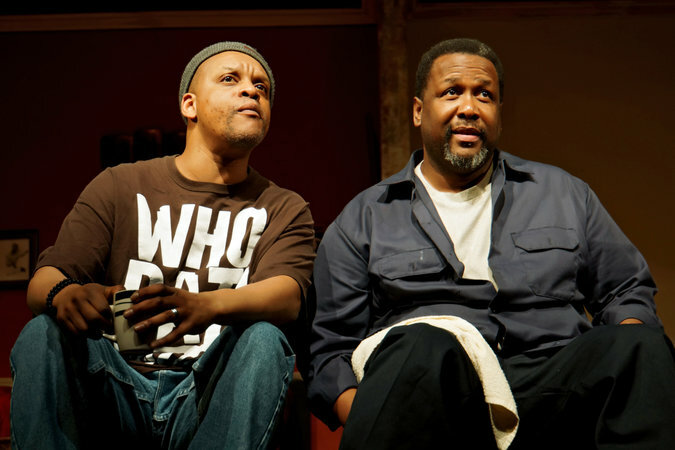 In a scene from Jackie Alexander’s timely and sympathetic “Brothers From the Bottom,” at the Billie Holiday Theater, two men stand on a shared front porch and argue about the fate of their neighborhood. Trey (Wendell Franklin) is involved in a plan to replace rundown houses with gleaming condos. His brother, Chris (Wendell Pierce of “The Wire” and “Treme”), is skeptical. “Sound like gentrification to me,” he says. “Revitalization would be a better word choice,” Trey insists. Whatever you call it, it’s happening all around New York — from Crown Heights to Washington Heights, from Ridgewood to Midwood. It’s happening in Bedford-Stuyvesant, the longtime home of the Billie Holiday Theater, and in Fort Greene, where that theater is currently in residence at the Brooklyn Music School Playhouse. “Brothers From the Bottom” unfolds in post-Katrina New Orleans, but the gasps and laughter from a recent audience showed that its subject hits home here, too. This naturalistic play is set inside and outside a double-shotgun house over the course of two weekends. In one half lives Chris, recently returned to work at the docks after years of unemployment, with his wife, Malika (Toccarra Cash), a nurse. Trey, a lawyer back in the neighborhood after some trouble in New York, and his wife, Lindsey (Megan Robinson), an opera singer, reside in the other. Mr. Alexander’s play, which he also directs, is shaky in some places, stolid in others. You can anticipate the central conflict (and the tender resolution) from the first scenes, and there’s an overreliance on convenient secrets and pat psychology. The second half sometimes suffers from speechifying, as Mr. Alexander articulates his thesis that renewal should come from within communities. Chris argues that other ethnic groups work to improve their neighborhoods. “Why black folks can’t do the same thing?” he asks, a query greeted with much audience approval. But if Mr. Alexander clearly sides with Chris, he’s smart and kindhearted enough not to demonize or dismiss the other characters. There’s love in here for Trey and even his friend James (Thaddeus Daniels), a real estate speculator. And many of the play’s best parts aren’t about its hot-potato subject, but scenes in which the characters drink and joke and chat about their lives. The few musical sequences are pure pleasure. Throughout, the acting stands way above the flood line. There are some indulgent moments and some hammy ones, but mostly, there are seriousness and joy. Mr. Pierce is terrific, and Kevin Mambo is particularly exuberant as Lou, Chris’s garrulous neighbor in a do rag, but everyone does fine work. When the script veers toward melodrama, these actors ground it with sensitivity and verve. The neighborhood may need renewal and repair. These performances don’t.